IPAM’s IP Request Wizard enables IP requesters to directly request IP addresses from network admins, and can automatically reserves IP addresses after three easy steps. SolarWinds® IP Address Manager offers several ways to automate IP address management. This includes API support, and VMware vRealize® Automation & Orchestrator integration. 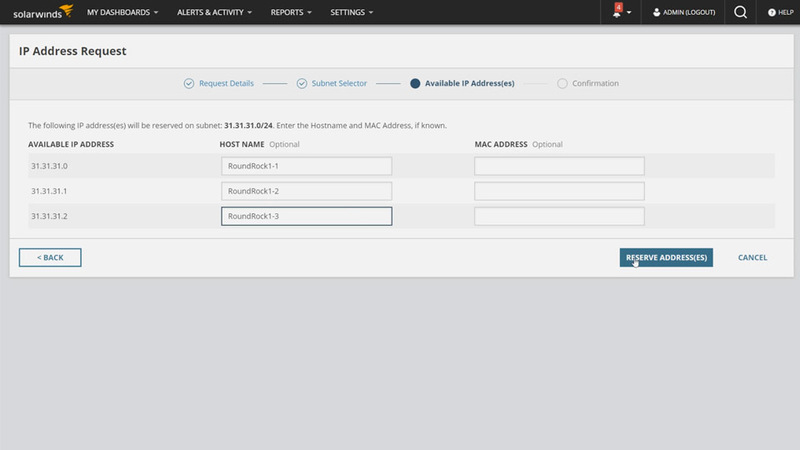 In addition, with IPAM's IP request wizard you can automate the static IP request process and speed the deployment of devices. Let's see how easy it is to reserve IP addresses using IPAM. Perhaps you are a field tech who needs IP addresses for three printers at a medical clinic and you have the necessary permission to complete an IP reservation. If you don't know which subnet to use, you can select 'No' to this question, and the network admin will receive an alert as soon as your request is submitted. The printers will be installed in the first floor lab of the clinic. On the next screen, you can quickly search to find the correct subnet or use the built-in filters to narrow down the options. The 'Clinic Lab Devices' subnet has plenty of IP addresses available. Here are the first three available IP addresses in the subnet that can be requested. We'll enter Host Names for each of the three printers and select Reserve Addresses. You have successfully reserved the IP addresses. To view the reservation go to My Dashboards and select Manage Subnets & IP Addresses. In the Clinic Lab Devices subnet, the IP addresses now show a reserved status. You can now assign the IP addresses to the printers. And that's all there is to it. In addition, IPAM can track all reservation requests with its automated reporting capabilities. These reports can be utilized for compliance or change management purposes. Automatically reserve IP addresses with IPAM's easy-to-use IP Request Wizard.